Northowram overturned a one-goal half-time deficit to put the skids under division-higher Calder ‘76 by 6-3 in the first round of the Halifax AFL’s Skircoat Green Physiotherapy Challenge Cup. Playing down the slope at Northowram Rec, the visitors got a goal in the first minute, Remi Allen’s cross being expertly volleyed home by David Trncik. The Premier side looked the livelier with Allen behind much of their best work and he set up a close range chance which brought a brilliant save from James Bunn. Ash Smee’s shot was acrobatically tipped over by Calder’s Matt Senior but when the keeper fumbled Matt Calland’s shot, Billy Farrell set up Calland to equalise after 23 minutes. Calder had tended to overplay the long ball downfield but a clearance from their area bounced into space and Allen’s flick on left John Moynes clear to lob the advancing Bunn and put his side ahead. The Rams were the better side by some distance in the second half, more committed, quicker to the ball and playing some neat football. Calland was denied by Senior one-on-one but amends 10 minutes later as he created the space near the corner flag to produce a low cross which Farrell swept home. Parity was short-lived, however, when Allen got the better of a tussle with Johnny Brownridge and prodded home. That was more or less as good as it got for the visitors and a harmless-looking ball into the area from Craig Collins was allowed to bounce and Calland toe-poked home. Senior made a brilliant double save but Collins lobbed him with 10 minutes left. Senior kept out a Collins penalty with his legs but a Smee tap-in and Popek’s flying header took the home side clear. Holders Greetland invariably save their best form for this competition and they put a 5-0 league defeat away to Shelf United the previous weekend behind them with a fine 4-1 success away to league pacesetters Midgley United. Midgley Rec is a happy hunting ground for Greetland; they won twice there last season including in the quarter-finals of this competition. Midgley had the assistance of a strong breeze in the first half. Joe Gibson and Rob Stansfield hit the woodwork and they created several chances but took only one, Andrew Butterworth scoring from Gibson’s knock-down after 30 minutes. Aaron Dorward got Greetland on terms five minutes after the break, Oliver Bagley gave them the lead on the hour and sprightly veteran Karl Jowett added two more. Home boss Craig Gee was dismayed by his side’s lack of fight after they fell behind and said they had been outplayed in the second half by deserving winners. Sowerby Bridge battled hard for a 3-2 home victory over Denholme United. Sam Hiley set the hosts on their way with a lovely left-foot finished after good build-up play from his brother Tom and Damien Watkins. Denholme equalised when a long throw seemed to evade everyone and bounced into the net but the referee deemed that the keeper had got a touch and awarded the goal. Tom Hiley restored Bridge’s lead on the stroke of half time with a penalty but Denholme equalised for a second time and the contest became end to end. With penalties looming, Watkins was the match winner with a header from an Adam Barlow corner with two minutes left. A treble from David Chappell sent Shelf United into the second round with a deserved 3-0 win at Sowerby United. He struck in the first minute when a quick break down the left and a good delivery left him with a simple tap-in. The hosts showed no signs of panic but were unable to create any clear cut chances whereas Shelf were always a threat through their quick breaks. The woodwork saved Sowerby twice as they went into half-time just one goal down. Both sides played some fine football in the second half but Shelf had a cutting edge and Chappell added another two goals. Champions Shelf FC powered through with an 8-1 home win over Salem, Alex O’Keefe continuing his free-scoring start to the campaign with three more goals. 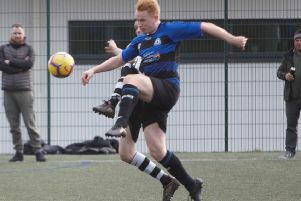 Brandon Field, Josh Landon and Luke Prosser hit the target on the Trinity Academy 3G as Illingworth St Mary’s beat Brighouse Sports 3-0 in an all-first division clash. Ryburn United’s quest for a first win of the season goes on after a 4-2 defeat away to Copley United, for whom prolific pair Gary Ash and Lee Worrall scored twice each. Kerry Muncaster and Jake Tate were the Ryburn scorers. Hebden Royd Red Star had the easiest passage when hosts Holmfield were unable to raise a team.